The other day, on my way to work, I noticed that this historical marker was missing. On further investigation this morning, I saw a hole in the ground where the marker post had been, further suggesting that the marker had been stolen, probably for scrap metal value, rather than removed from its post for repairs. 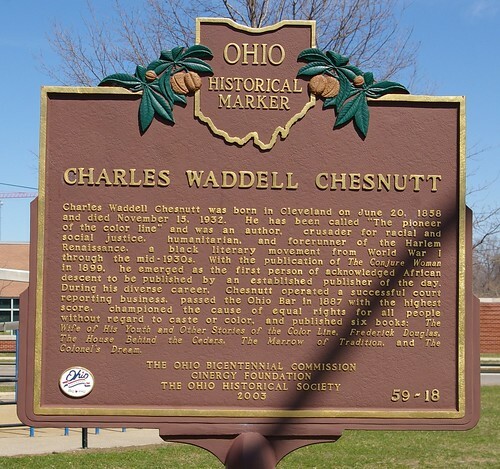 I contacted the Ohio Historical Society, which admisters the program, and they said that they have no record of the marker being removed for maintenance. Chesnutt lived in this house, at 9717 Lamont Avenue, from 1904 until his death in 1932. It is just down the street from the site of the historical marker. It was demolished to make way for Charles Orr elementary school. 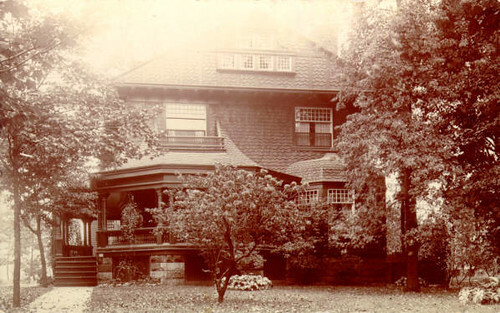 The Cleveland Public Library has a collection of photographs relating to Chesnutt, his life, and this house. Chesnutt's previous residence, 64 Brenton Street, (now 2212 East 73rd) was his home from 1888-1904. It has also been demolished. My usual tendency is to be more concerned about preserving historic sites than erecting markers once buildings have been demolished. 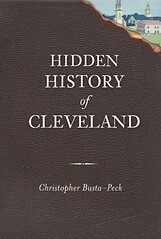 I've come to realize that we've lost so many sites important to the history of the Cleveland area that the only way we can share the history of our neighborhoods, in some cases, is to memorialize what has been lost. In this case, this means installing a new historical marker. According to the OHS pricelist a replacement marker will cost about $2,000. There are some that will argue the money might be better spent on other things within the neighborhood. To this I respond that we have to illustrate the history and potential of neighborhoods in order to make people want to live in them. I remember being blown away by "The Conjure Woman". What about a public reading of Chestnutt's work (or maybe more broadly, Cleveland-connected African-American writers) to raise money for this project? How to they secure those markers in the ground? Are they embedded in concrete, or just stuck in the ground? I would think they could make them hard enough to remove so that they would be unlikely to be stolen if it is a neighborhood where people watch out for each other. There seems to have been surprisingly little concrete - less than I would use for a fence post. Has there been any progress on getting the marker replaced since this post?